It's that time again. Time for another lovingly produced episode of This Developer's Life. I blogged a few weeks ago about a new developer podcast called "This Developer's Life". Twice a month, Between Rob Conery and I, we'll bring you stories from the mouths of real people, some you know and some you don't. This week we talk to two programmers who hit "homeruns" early in life. First, David Heinemeier Hansson, creator of Ruby on Rails, who was born in 1979. 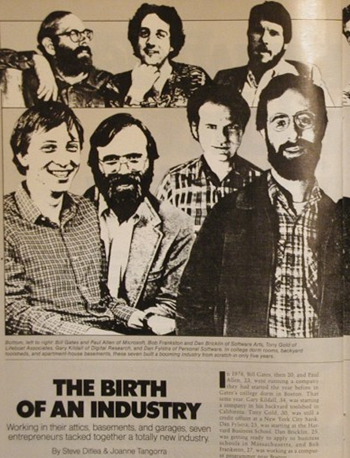 Next, Dan Bricklin, creator of VisiCalc, the first electronic spreadsheet creating in, yes, wait for it, 1979. What do you do when you hit a homerun? When do you know it's happened? And what does it mean 30 years later? Don't forget, you can subscribe via RSS, via iTunes or via Zune. Here's our previous episodes, if you want to catch up. What makes people mean in our industry? What about aggressive? Confident? What's the difference? Would you rather have a drill sergeant for a boss, or a zen master? We talk to Cyra Richardson and Giles Bowkett. How do you solve problems as a developer? How do you tackle issues that seem completely unsolvable - as an individual or on a team? Mike Moore, Javier Lozano, Tamar Cohen and trouble. Is fame useful for a developer? Should you make a plan and become Internet Famous? Is there value and how does notoriety happen? John Sheehan joins me in the storytelling. It eventually happens to everyone. The real question is, how do you deal with it when it happens to you? Oren Eini and Sara Chipps explore and share. That's my shtick, Conery. Get your own speaking style. Woo! A couple of months ago I would've punched somebody in the face just for saying the word "podcast", and while I'm still not buying into them in general (or any of the newer web stuff I've been avoiding for the past five-plus years) I've been looking forward to a new TDL almost as much as Caprica.